1) what size you would like them printed. For example, someone bringing in a small wallet sized photo will be asked if they wanted it print the same size as the original or if they would like it to be enlarged to fit the paper. We suggest printing old photos that are black and white on Matte paper and we suggest printing color photos on Glossy paper. You will also want to consider the type of finish that the original image had and probably make it similar. Keep in mind that photos printed on Matte paper are duller and not as bright while photos on Glossy paper are brighter since more light is reflected. If you want a photo cropped a certain way, not just evenly from the center, we can do that too. Maybe you have a certain person or item that you want cropped out of your photo… we have a small additional charge for doing a customized crop to your photo. How big can I enlarge it? We can scan your image at a higher resolution which will allow us to print a good quality image at a larger size. We recommend that photos we print have a resolution of 300 dpi. We scan all photos and documents at 300 dpi and scan slides and negatives at 1200 dpi (this allows printing of a good quality 4″x6″ photo). If you want to print a photo larger than the original then we will need to increase the resolution that it is scanned at. If you want to make a photo twice as large then we need to scan it at twice the resolution (so 600 dpi for documents and photos and 2400 dpi for slides and negatives). 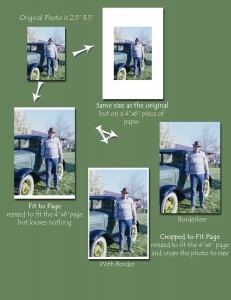 Another factor that determines if your photo will look good when enlarged is to take a close look at your original. Any flaws you see will be enlarged. Marks that aren’t noticeable in the original may be distracting when enlarged. One of our scanners allows us to scan up to 12,000 dpi which is huge…but makes a huge file. To use this resolution your original would need to be pretty small so it doesn’t overload the computer.